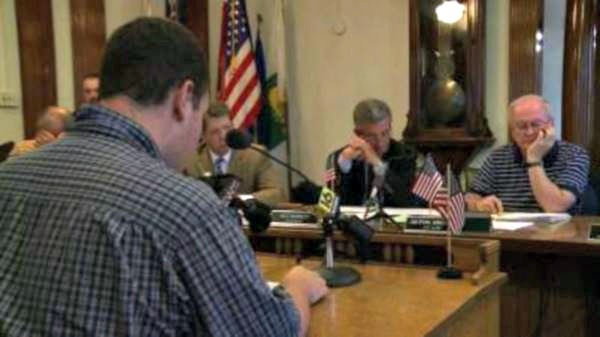 I addressed Wilkes-Barre City Council with my objections to government-led prayer which opens city meetings. Read a full report of events leading up to my objection accompanied with many links and videos including my exchange with council. 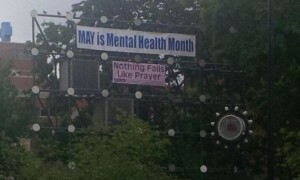 See the ‘council prayer‘ category for more updates in this ongoing story. I issued a renewal of my 2009 debate challenge to theists which was published on my website and in a local newspaper. Following the debate challenge’s posting, Rev. Michael Brewster of First Baptist Church in Wilkes-Barre, Pennsylvania accepted. More details are to come. 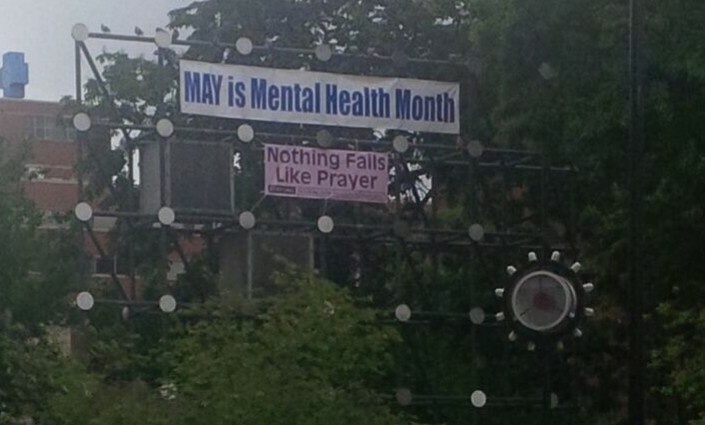 With the help of the Freedom From Religion Foundation (FFRF), I had placed a banner reading “Nothing Fails Like Prayer” atop Public Square in Wilkes-Barre, Pennsylvania. Read my news recap for related information. I protested a Wilkes-Barre, Pennsylvania event recognizing the National Day of Prayer. I greeted prayerful individuals with a sign reading “Nothing fails like prayer” and “Religion and state is a dangerous mix” promoting the Freedom From Religion Foundation and my Skeptic Ink Network website. Read my post- and my pre-event thoughts. In January of 2012, I proposed what was later dubbed ‘the most inoffensive atheist bus ad ever.’ The ad, containing the word ‘atheists,’ was denied by a county bus agency on grounds that it was ‘an attack on religion,’ ‘controversial,’ and ‘an attempt to start public debate of controversial issues.’ The story was heavily covered throughout the secular blogosphere and twice appeared in national news. I appeared on local television, radio shows, and in local print media. Click here for more information. 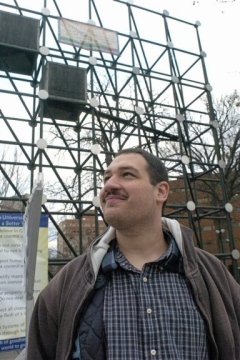 Working with the Freedom From Religion Foundation (FFRF), I had a freethought holiday banner displayed on Public Square in Wilkes-Barre, PA – joining a Jewish banner and a Christian nativity scene. Soon after placement, the banner was vandalized by someone who was videotaped, appeared on a television news report, and appeared on a local talkradio show. Click here for more information. Early in 2012, Pennsylvania’s House of Representatives named 2012 as “The Year of the Bible” calling — in a resolution which unanimously passed — the Bible as the word of God and holy scripture. 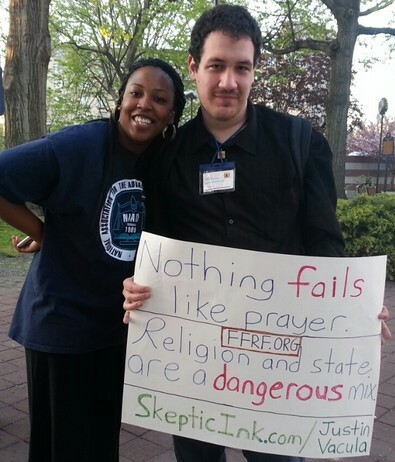 The FFRF sought members to be named in its lawsuit against the state of PA. I was chosen and included as the second member in a list of close to fifty. The lawsuit was dismissed on grounds of legislative immunity although court papers noted “The Year of the Bible” was “proselytizing,” “alarming,” “exclusionary,” and pushing the envelope of the Establishment Clause. Following local pastor Michael Brewster’s appeals to the supernatural concerning a shooting death of a local youth, I wrote a letter to the editor to a local newspaper. View all of my writings on this matter, including the letter to the editor, here. 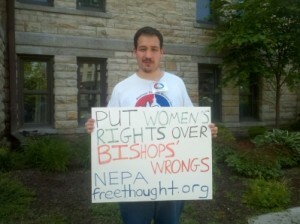 I protested a “Stand for Religious Freedom” rally in Scranton, PA. While the rally contained various persons with differing aims (ranging from wanting to make contraceptives and abortion illegal to general right-wing opposition to President Obama), the rally was intended to be a religious-based objection to President Obama’s Affordable Care Act on grounds that it violates the consciences of Christians. The rally, including my protest, was covered in local print media. Read my commentary here. 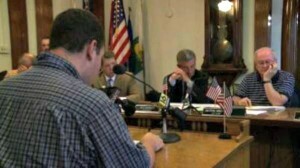 In November of 2011, I attended a Pennsylvania House of Representatives session with fellow atheist activist Carl Silverman in which we were coerced by an armed guard when we did not stand for [a governmental sectarian] prayer. After some research from the Freedom From Religion Foundation (FFRF) following Carl and I complaining, the FFRF sent a letter to the PA House of Representatives. 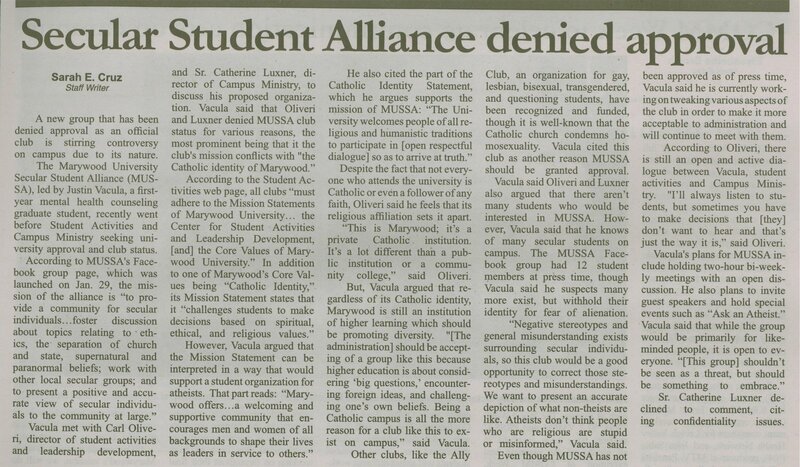 Upon starting graduate school at a Catholic university, I launched efforts to start a chapter of the Secular Student Alliance. My request was eventually denied and a school newspaper article was published detailing my efforts and the corresponding denial. I had complained to the FFRF regarding the placement of a “God Bless America” message on county buses which appeared where route information is typically displayed. Following a letter the FFRF sent to Lackawanna County/COLTS, the “God Bless America” messages were removed from county buses. Soon after discovering a chiropractor was invited to attend the “Celebrate Your Body Wellness Fair” at Marywood University, I researched the chiropractor and sent a letter to the organizer of the fair requesting that only evidence/science-based medicine be included at the fair. Following my criticism of a local chiropractor who fuses theology with pseudoscience, I received legal threats. View all related posts here. Following media coverage of a local public school principal who appeared to participate in a prayer event with elementary school students, I complained to the FFRF and a letter was sent to the school district. Following a newspaper story about a ‘paranormal science’ group partnering with the Luzerne County Historical Society in investigation of a local historical site, a letter to the editor I wrote disputing the group’s claims of scientific investigation was published. 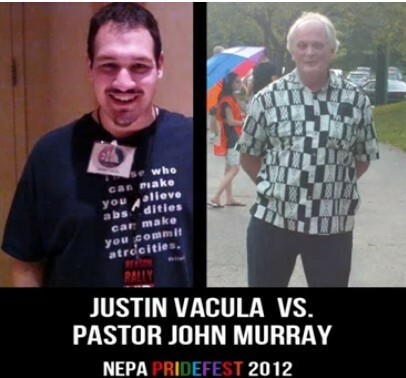 Following a tremendous amount of hate mail I received following church/state activism in 2009, I issued a public debate challenge to the religious of Northeastern Pennsylvania. I would later debate a a local Methodist minister (watch the debate video here). NEPA Freethought Society members countered a church group protesting a local LGBT festival. Read my commentary here. Following a story in a local newspaper discussing a woman enlisting the help of a self-proclaimed psychic, I wrote a letter to the editor rebuking the psychic. I filed a complaint with the ACLU concerning stand-alone religious displays at the Luzerne County Courthouse. The displays were eventually taken down and later erected as part of a larger inclusive display. I received a tremendous amount of public backlash and hate mail from fellow college students and members of the community. For information concerning the ‘nativity controversy,’ click here. 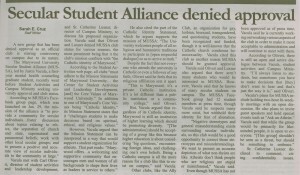 During my third year at King’s College — a Catholic college in Pennsylvania — I attempted to start a Secular Student Alliance group. My efforts were stifled because, according to college administrators, the group’s mission statement was not in accord with the college’s mission statement.